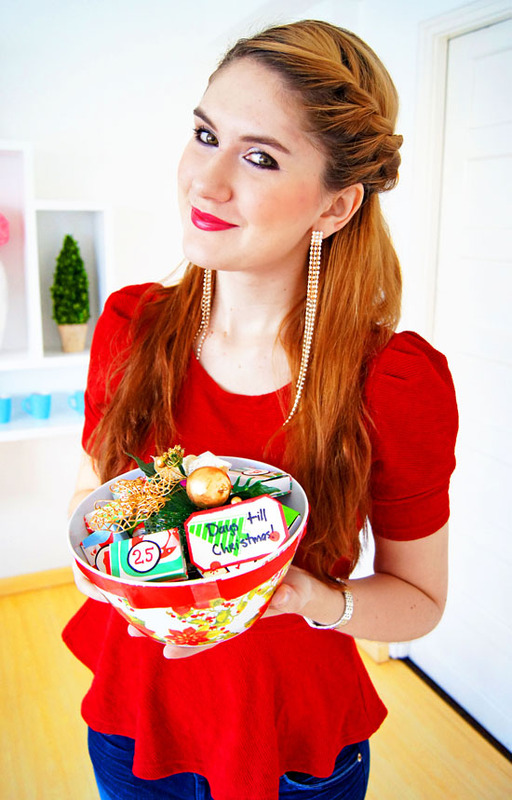 Here is an easy and cute Christmas DIY Project: An Advent Calendar! As some of you may remember, I made this cute project as an early Christmas present for my boyfriend. I hope you all like it! Empty the matchbox from its matches, and wrap it with Holiday wrapping paper. Draw a circle on white paper using a Nickel ($0.05) as a guide. Use the markers to outline the circle and draw a number. Repeat until you have 25 decorated matchboxes. Fill the matchboxes with all sorts of treats. I used chocolates, candy, drawings, inside jokes, funny pictures, and photos. The possibilities are endless! Put all the boxes in a cute bowl or box, and gift it to someone you love! hi Marie! this is an awesome idea for Christmas, I like it! Glad to hear you liked it Kiti!! YAI! Thank you so much Kimberly!! Yeah, he was really pleased with it. He especially enjoyed all of my funny drawings, hehehe. Thanks for stopping by! Thank you Alexa!! You are always so sweet to me, thanks! This is such an adorable idea! I love Christmas and finding additional ways to celebrate the holiday throughout the month. I will have to make one of these for next year. Thank you Annabelle!! I'm so glad to hear you liked this DIY! Oh my, this is such a cute idea, I looooove it! The little matchboxes make such cute presents, did you come up with this yourself? I love your DIY posts, such great ideas! Loving your outfit as well, red looks great on you and the earrings are amazing! Aaaaww, thank you Jody!! It makes me SO happy to hear that you enjoy my DIY ideas, that keeps me motivated to do more! Hhehe. I actually got the idea from a similar Advent Calendar picture I saw on pinterest. I liked the idea of the matchboxes and adopted it on my own style. So glad to hear you liked it! Thank you!! So glad to hear you liked it!